Doulas assert specialized knowledge of the complex intersection of emotional, physical and medical aspects of childbirth, yet simultaneously, portray themselves as kind, caring women with a natural, intuitive ability to improve clinical outcomes in medicalized settings. These claims are complicated by several factors. First, a profession is technically defined as a group that controls entry into its own ranks and possesses specialized knowledge verified through credentialing and licensing. So admission to the profession is strictly controlled through organizational means. But anyone can call themselves a doula – as yet, an unlicensed occupation. Further, the doula’s claim to specialized knowledge is largely experiential, and rests on the constructed, collective experience as women who have birthed socially, among women, since ‘the beginning’. The dilemmas posed by this juxtaposition create challenges for individual doulas and their organizations. Further, the effect of these viewpoints is that they obscure the real skills, talents and value of what doulas do accomplish. I was really nervous before I got there but it was good that I didn’t have a lot of warning because I just had to go and do it. I remembered what they said at training was ‘All you need to do is be there—if you are just there it improves the outcome, anything you add on top of that is just a plus.’ Fine, I thought, I can be there. Doula Lorie Nelson identifies the requirements of a good doula this way: Unconditional love. You know, willingness to work with whatever judgment comes up inside of them. I think that is the key factor in a really good doula because I believe that exhibiting caring and respect for the woman regardless of what she’s going through or what she’s choosing is a validating force that that can change her perception of herself in a difficult situation. It’s the most challenging thing for many us. It takes great physical stamina to be a doula. I think …it also takes a high level of sensitivity/perception/ intuition to continually track the energy of the room, of the parties present, and what the woman’s needing. Doula practice is explicitly considered ‘women’s work.’ The term doula is itself gendered, coming from the Greek meaning ‘woman serving woman.’ Although the term is often reframed to be more gender-neutral, (‘experienced labor companion’ or ‘labor support person’) in cases where a pronoun is called for, the feminine is used. Doulas themselves see the work as uniquely female. I came away feeling so incredibly HIGH and exhilarated. I don’t know how doctors or nurses can do this and do it so impersonally. To me, birth is sacred. There is a story surrounding each new life—connecting the story to the lives that will be responsible for this new one for some time. I am in awe of the incredible leap of faith that goes into having a baby. I felt like I passed the test. I am a doula. I can do this. Still, receiving rebukes while at a birth from either the client or obstetric clinicians can be devastating to a doula’s sense of competency and personal worth. At a doula retreat organized by local trainers, many women disclosed their own unexpected discovery that they felt unprepared to do the emotional support required of doulas. 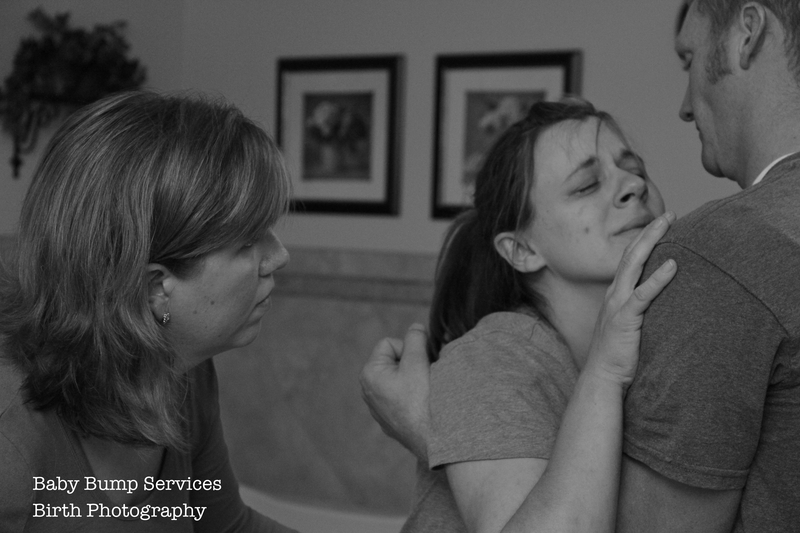 It was, however, a revelation for them to share their feelings with others, and give it a label, “doula doubt.” Many factors contribute to doula vulnerability: personal issues with birth, an insecure role within the medical hierarchy, and lack of experience are implicated in how individual doulas respond to the interactional demands placed on them to provide doula care, when it doesn’t come naturally. Work that is defined as “caring” has been a rich source of feminist analyses that attempt to balance the humanistic underpinning of such caregiving with the economic devaluation of the work itself. Caregiving work embedded within reproductive contexts also poses interesting challenges for theorists who explore work, gender and emotional labor. Doula practice provides us with a unique case study to examine how the gendered and emotional meanings of work are “simultaneously expected and rendered invisible” in a newly emerging occupation. It is especially important for examining how the emotional component of intense caregiving work can be seen not merely as an example of economic exploitation as well as an exploration of gender, but also as a motivating factor for the work, in its own right. The caregiving dimensions of doula practice can be compared with the contradictions and tensions emerging in other types of care work, paid and unpaid. Doulas experience this clash of value systems when the central definition of what it means to be a competent, effective doula also includes a personal identity as a caring, nurturing woman. Contradictions around being ‘selfless’ and ‘of value’ are heightened at a time of socially recognized, ritualized vulnerability—childbirth. What does it take to become, and to be, a Doula? Doulas understand themselves to be ‘special women,’ who have a deep interest and ability to care for other women during childbirth. This interest and ability is often characterized as ‘uniquely female’ but doulas readily acknowledge that not all women are interested in birth. Among the many factors that bring women to doula training are a long-standing interest in birth and an orientation toward caring for others. Many women described their reaction to finding out about doulas and doula training as something they had always been looking for but didn’t know existed. They did not want or were unable to become a nurse, midwife or physician, but they still wanted to be around births. It takes much less time and money to become a certified doula than it does to become a certified childbirth educator. An unlicensed occupation, there are no formal requirements for calling oneself a doula. However, the steps to certification involve finding an organizationally approved training workshop locally (usually available within a day’s drive of most metropolitan locations), paying for the course and materials, reading some books and spending time at a training. Attending the required number of births and doing the paperwork to become certified takes a bit more time and effort. During training, doulas learn the definition and parameters of the doula role, the medical and emotional impact of doula-attended births and in particular, how doulas accomplish their job of providing ‘physical, emotional and informational support’ to the laboring woman while protecting the memory of her birth experience. Doula care is presented as a return to the community-based, woman-centered care that existed prior to the shift from home to hospital births in the early part of the century. In conveying this message, doula trainers emphasize collectively shared, community-centered support of women’s birthing experiences. This focus asserts that birthing has been women’s work, that women intuitively know how to birth but our current culture has developed birth models that interfere with this intuitive knowledge and shared historical practice. Doula trainers present an alternative model for how woman-centered support can reclaim a place within medicalized childbirth in Western cultures. Trainees learn that their non-medical role is what distinguishes them from maternity care providers and this fills a gap within the current hospital provision of childbirth support. Closing this gap takes two forms: first, the doula’s focus is specifically on the laboring woman’s emotional and physical comfort needs, rather than clinical issues. Second, the doula provides continuous presence and personalized attention to one woman in contrast to the competing demands of the clinicians present, whether nurse, midwife or physician. In addition to the focus on the non-medical aspects of their own role, doulas learn that pregnancy and childbirth are normal, non-pathological life events. This notion is embedded in the midwifery model of care, described as a holistic approach; one that attends to the diverse aspects of pregnancy and birth: physical, emotional, spiritual, social, economic, cultural, and sexual. Trainees also learn the basics of childbirth physiology and other necessary information, but the emphasis is on birth as a natural physiological process occurring in healthy women, and the fewer medical interventions, the better the outcomes for both women and their babies. Despite the emphasis on their non-medical role, doulas are nevertheless expected to be conversant with standard medical practices surrounding birth. 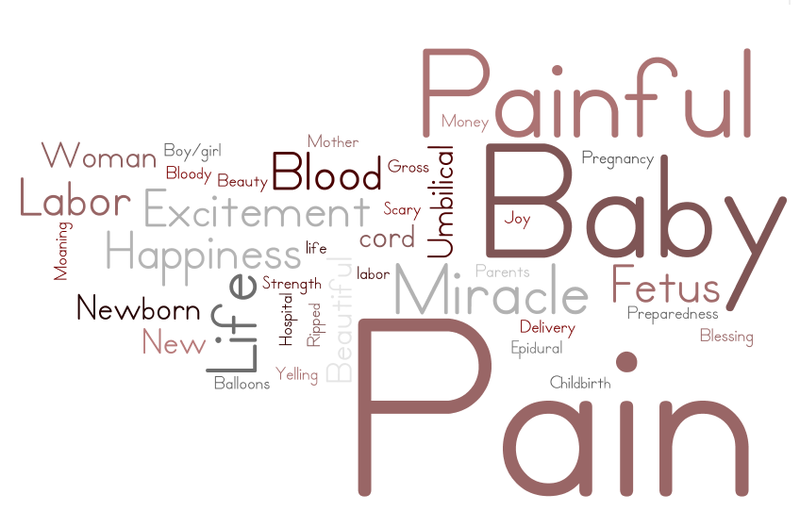 Trainees learn about pain medications used in labor, and the kinds of information they are expected to give their clients prenatally and during labor to help them make informed decisions. Although critical of the unnecessary use of medical interventions, trainees are expected to be familiar with their indications. Knowledge of anatomy and physiology of childbirth is encouraged in order to understand how to help labor progress in situations where the baby is not in an optimal position. Doula trainers present the view that labor support should include unconditional emotional acceptance of women and their choices, practical physical assistance and as much information as women need to make decisions that are best for them. Although trainers stress that birth is ‘not just another day’ in a woman’s life, and provide scientific rationale for continuous labor support, they also emphasize the importance of not judging women’s choices for their births or advocating one’s own beliefs on behalf of other women in medical settings. Doulas learn that one of the most powerful ways they interact with their clients at births is by reframing what is happening from something that is negative or scary into something that highlights the normalcy of labor or the agency of the birthing woman. Trainers communicate the value of reframing events in order for the woman to have a story to tell that places her decisions at the center. Doulas are often present when the first telling of the birth story is announced to family members, especially when it occurs within minutes of the birth. The injunction to ‘protect and nurture the birth memory’ is conveyed during training through a variety of means, including hands-on physical comfort measures. But what the doula says is as significant as what the doula does in shaping the story of that birth for the woman, her partner and their families. At the postpartum visit, trainees learn that the doula is there to see and admire the baby, and hear the woman’s story of the birth. Trainers caution the doula to not assume that the woman will agree with the doula’s perspective of the birth. Thus trainees learn that a large part of the doula’s impact on the woman’s memory of birth is accomplished through continuous presence, unconditional support, and reframing events, as they happen, so as to acknowledge and validate the woman’s effort. In the event that the woman feels unhappy or disappointed about some aspect of the birth, the doula’s role is to validate her feelings about what happened, but reaffirm choices she made by reminding her of the factors affecting those choices. This reframing activity is a major part of doula training, designed to ensure a ‘positive birth memory’ for the woman, regardless of the doula’s opinion or experience of the birth. Women who do not actively practice but intend someday to start or resume doula work still have a place in the doula world; they feel part of the community but are likely to have other family or life commitments. No doula ever renounced the ideology, much like the phrase in midwifery, “once a midwife, always a midwife.” As they continue doula work, many women move into allied childbirth fields that offer more professional status, better income and stable work. Other doulas enroll in midwifery or nursing school to further their interest in technical aspects of maternity care as well as increase their earning potential. Those who came to doula practice from another field, such as social work or counseling, continue to work in those domains but find their newfound experience working as a doula enhances their professional skills and empathy. The typical practicing doula, then, is a woman who has been drawn by passion to provide care to other women during their births. She has adopted a belief in the transformative and empowering effects of unmedicated, low intervention childbirth but also in the right and ability of women to make their own choices. She strives to provide education and information to women that will give them an open mind to experience whatever lies in store for them at their births. She networks intensively with others who share her beliefs and help her attain her goals. Ideology, rather than professional status or economic reward, keeps her going, with the conviction that she is changing the world, and making a difference. This blog post by Christine H. Morton, PhD and Monica Basile, PhD, CPM, CD(DONA), CCE (BWI) was originally posted on Lamaze International’s Science & Sensibility Blog in two parts (March 28th & April 2nd, 2013). Reposted here with permission. How can doula supported births help reduce the cesarean rate and realize cost savings within Medicaid-funded births? Two studies published in early 2013 offer the opportunity to address this complex question. We support the goal of increasing access to doula supported care to childbearing people of diverse racial/ethnic and class backgrounds, and we are pleased that discussions are taking place about how doulas may be able to help reduce racial disparities in maternal and infant health. We recognize that work toward these goals requires policy advocacy, which depends heavily on economic arguments for the benefits of doula care. However, by limiting the discussion of benefits to the economic impacts of reduced cesareans, advocacy for Medicaid funding of doula supported births—without specifying the doula model of care and without according true value to the doula’s impact—may have unintended consequences for individual doulas, and the organizations that represent them. One such consequence may be that the resulting system will continue to perpetuate a model of economic marginality and potential exploitation for the doulas who serve a low income population of childbearing people. The AJPH study by Katy Kozhimannil and colleagues in Minnesota received a lot of media attention when it appeared last month, even live coverage in the Huffington Post. This study compared 1,079 selected Medicaid doula patients in Minnesota to Medicaid patients nationwide for their total cesarean rates. They found that doula clients of a community program in Minnesota had a rate of 22.3% while national Medicaid had 31.5%. The authors reported three scenarios, all assuming that if states reduced cesarean rates, by offering doula services, there would be varying levels of cost savings, depending on the cesarean rate achieved, and by reimbursing doulas between $100-300 per birth. In our view, the Minnesota study design raises several methodological questions, which are applicable to this study and to future research on doula-attended births. We outline those questions here, as well as raise several more substantive concerns about the implications of the study’s stated conclusions. Why did the researchers not compare Minnesota Medicaid doula clients to Minnesota Medicaid women who gave birth? Minnesota has a much lower rate of total cesarean that the US as a whole (27.4% during this time period), and this would have been a better matched comparison. A better comparison would be doula attended births vs. non-doula attended births at the same facility. It is not clear from the study whether the doula program whose data was utilized served women at one or multiple hospitals in Minneapolis. Why did the researchers not limit their investigation to primary cesareans? Doulas typically support women in labor rather than women undergoing repeat cesareans. The total cesarean rate includes repeat cesarean so it will be much higher than the primary cesarean rate, which is more applicable to doula clients. Including total cesarean rates means that the researchers are comparing a limited universe (doula support of women in labor) to all births (thus including repeat and primary cesarean). The data source for this study, (Nationwide Inpatient Sample), however, does not have this information. Cesarean rates are very dependent on the parity distribution of the birthing population, so first time mothers need to be compared to first time mothers and multiparous women to multiparous women. This information is not available in the data source used by the researchers, but in future studies of this type, it is critical to verify that the proportion of each is the same in the intervention and control populations. States are implementing a number of payment reform models to reduce cesareans among women covered by Medicaid, with limited success. In part, that is because cesareans are influenced by a number of factors, with payment incentives only one. (Many of these issues are covered in the CMQCC white paper on improvement opportunities to reduce cesareans, which argues that a multi-pronged strategy is necessary). Because hospital rates of cesarean have been shown to have high geographic variation in a number of studies (Baicker 2006; Main et al 2011; Caceres 2013; Kozhimannil 2013), it may be more feasible to have comparison groups of hospitals with similar primary cesarean rates. Until we understand what accounts for variation in cesarean rates between institutions (unit culture; facility policies and protocols), it may be premature to assess the independent effect of labor support by a trained doula. While doula support is associated with fewer cesareans across the board (Hodnett 2012), the methodological issues described above are likely to over estimate the benefits of doula-attended births in terms of reducing the cesarean rate for Medicaid covered births. This, in turn, raises questions about the purported cost savings. In the Minnesota study, the cost break point is no more than $300 dollars for the doula per birth. In most cities, doulas charge well above this amount for fee-for service care. A cost-benefit analysis by Oregon Health & Science University researchers for the Oregon State Legislature was presented at the Society for Maternal Fetal Medicine in February 2013, which found that doula care in labor provides a cost benefit to payers only when doula costs are below $159.73 per case. In that study, data sources are not entirely clear, but do seem to come from the OHSU facility where a hospital-based doula program is in place. In that program, doulas are on call on weekends only and come to assist in a labor when requested by the woman during her prenatal care or when she arrives at the hospital. A case-control study claiming the benefits of this doula model at OHSU was published as an abstract, and although it claims “women receiving doula care were statistically less likely to have an epidural during labor (p = 0.03), have an episiotomy (p = .03), or cesarean delivery (p = .006) and on average, doula attended women had a shorter hospital stay compared to the control group (p = .002),” nowhere does it show what the actual rates were. This is important, because, they are likely to be relatively low overall, given that OSHU is a teaching hospital, with midwives and family practice physicians providing maternity care. There are several types of doula models; not all have the same components. The community-based doula model, as exemplified by the HealthConnectOne approach has a solid evidence base. This model employs doulas who are trusted community members, and provides extensive prenatal and postpartum support in addition to continuous labor support. Doulas work collaboratively with community organizations, have extensive training in experiential learning and cultural sensitivity, and are paid a wage commensurate with their value and expertise, serving an important workforce development and grassroots empowerment function. Some so-called community doula programs do not incorporate all these components. In cost-benefit or cost effectiveness studies, it is critical to clearly specify the doula model of care on which the economic model is based. It seems the doula model in the Minnesota study incorporates extensive pre- and post- partum contact and that there is an attempt to match doulas and clients in terms of race/ethnicity and language, but this is not always possible. The study does not indicate what the doulas in the Minnesota program were paid, however, and that information was unavailable on their website. Before we move to the topic of reimbursement, we want to note that the type of doula model is critical for assessing the benefits of doula-attended births. The research clearly shows different outcomes for doulas who are affiliated with hospitals compared to those who work independently (Hodnett, 2012). If a cost benefit model shows little gain in terms of outcomes, or yields a price point in the low hundreds of dollars, it may be that findings are affected by the assumptions embedded in the calculations. Recruiting a diverse population of trained doulas, however, may be difficult in the current environment. It is likely that doula work will not become more lucrative or appealing unless more people are willing to pay for these services or third-party reimbursement becomes more common. Doulas themselves report that their work is emotionally satisfying but not financially rewarding. Broadening the payer base will likely enhance the feasibility of a doula care business model for a wider range of women and facilitate recruitment of doulas from low-income communities, communities of color, and immigrant communities. 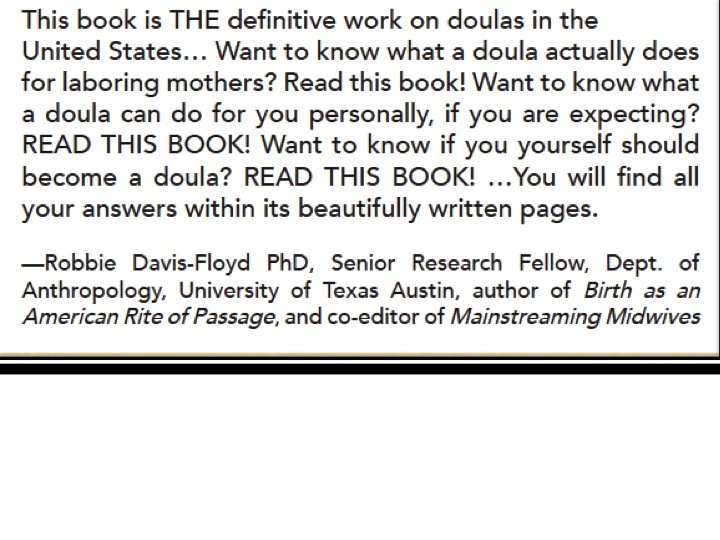 While acknowledging that doulas are mostly white, middle class, relatively educated women, the authors stop short of recommending, as we do, that an important step toward the goal of increasing access to doula care is the need for individual doulas and doula organizations alike to take a close look at ways in which doula culture itself is white and middle-class centered in terms of its priorities, the content of training programs, and the accessibility of doula training and certification. This is not to minimize efforts to promote diversity in the doula community that are currently underway, particularly those of the International Center for Traditional Childbearing, HealthConnectOne, and other community programs such as Everyday Miracles and Open Arms Perinatal Services. However, greater attention needs to be paid to issues of privilege and oppression within the doula community at large. Advocates need to consider how the prioritization of the cesarean rate as a primary research or policy issue reflects a certain level of unexamined privilege. For those facing spotty access to health care, cultural and linguistic incompetence in care settings, the detrimental effects of the prison industrial complex and the child welfare system on families, and the effects of poverty, racism, and/or homophobia in general, there are other, perhaps equally pressing concerns surrounding childbirth than over-medicalization. Certainly, unnecessary cesareans and over-medicalization are detrimental to everyone, but we need to understand how the effects of these problems play out differently for differently situated people and not limit advocacy to these issues. The authors also propose that a below market reimbursement for services ($100-300) is a feasible business model and would be sufficient to recruit doulas from “low-income communities, communities of color and immigrant communities.” This claim raises serious concerns on our part, two social scientists who have conducted qualitative research on doula practice and have spoken with hundreds of doulas about the economic conditions under which they work. The assumptions embedded in the above quote assume the emotional rewards balance the economic ones, without acknowledging that even doulas who charge market rates find it challenging to make this occupation financially sustainable. How then, can a doula program based on Medicaid funding be sustainable with such a low reimbursement rate? Further, while hospital, volunteer, and community-based doula practices alike require loyal and committed doulas who work within them, it is not clear that any doula practice, let alone one that pays so little, can scale to meet the needs of the nearly two million women whose births are covered by Medicaid each year in the U.S. Doulas themselves, as representatives and members of the communities they serve, should be at the forefront of driving policy decisions about the work they do. If we believe that Medicaid clients with doula support at their births will have improved outcomes (in terms of racial/ethnic disparities in cesareans and breastfeeding, etc.) that have been persistent and worsening for such a long time in the current US maternity system, then the American way is to regard these doulas as experts in supportive care in labor and reimburse them in a manner that reflects and respects that expertise and value. Otherwise, we will potentially create a system of institutionalized racism that we are ostensibly trying to eradicate. Ms. Capestany speaks from long experience of involvement in community doula programs in the state of Washington, which had doula services covered under its Maternity Support Services (a Medicaid program) from 1992 through 2004, well before Oregon’s recent policy. Advocates for Medicaid funded doula services can learn valuable lessons from the Washington experience. At the start of this public payment for doula services, doulas were a new concept, the newly formed doulas of the Pacific Association for Labor Support (PALS) viewed the program as a way to obtain clients and achieve their desire to provide doula care to a high-need population. The payment (about $40 per visit as a community health worker, with up to four visits per client, including the birth) was at most, around $160. One critical policy issue was determining whether doulas in training could use births paid by Medicaid for certification purposes. After some discussion and debate, it was decided that as an issue of social equity, women who were poor should not be the ‘training ground’ for aspiring doulas, and the program required certification. Early on, this was not a barrier. However, as the doula concept spread, and more childbearing people were willing to pay out of pocket for personalized labor support, it become challenging for the local organization, PALS, to find certified doulas who were willing and able to provide services for Medicaid clients. Program managers at PALS reported that another concern was that some doulas provided a lower quality and level of services to their Medicaid clientele compared to what they offered their private paying clients, because of the differing remuneration. One of the ironic inversions in the Washington program was that white middle class doulas were caring for low-income clients (about a third of whom were people of color). Yet the few doulas of color who sought to provide fee-for-service doula care reported they were often not hired by prospective clients, who were primarily white, and upper to middle class professional couples. In 2004, when Washington’s Maternity Support Services program was revised with the intent to incorporate doulas more formally as part of the care team, and to increase the reimbursement rate to $250, its application was reviewed by the federal government, which questioned the use of non-licensed providers. In response, Washington state withdrew the doula component in order to save the remaining elements of the program. Nearly a decade later, advocates for including doulas in Medicaid plans are proposing fees of at most, $300 per birth, with an unspecified model of doula care, and claiming this will address long standing racial/ethnic disparities in neonatal and maternal health outcomes, as well as reduce cesarean rates. Open Arms Perinatal Services, does record lower cesarean rates among the women served by Open Arms doulas. But importantly, Open Arms pays its community-based doulas at the low end of the market rate in Seattle, or $700, as a matter of work equity. Open Arms also has doulas who volunteer their services, who represent half their doula population. It is crucial that policy discussions focused on improving maternity care bear in mind that high cesarean rates are primarily a problem of obstetric culture and practice. The solution to this problem, then, needs to involve reforming obstetric practices from within, and cannot rest wholly on the shoulders of doulas. The most recent Cochrane Collaboration report on doula care points out that in addition to doula support, if reductions in cesarean rates are to occur, “Changes to the content of health professionals’ education and to the core identity of professionals may also be important. Policy makers and administrators must look at system reform and rigorous attention to evidence-based use of interventions that were originally developed to diagnose or treat problems and are now used routinely during normal labours” (Hodnett, 2012). Cesarean rates are influenced by a complex set of drivers and constraints that operate at the individual, hospital and state level. Studies on cost-benefit analyses that do not account for the variation in state and hospital rates as well as facility-level policies and protocols affecting clinical practice have the potential to obscure, rather than clarify, the problems at hand and the role of doulas in solving them. Proposing the doula as a bandage to a gaping wound may staunch some of the blood flow but it won’t address the underlying problem, which is a massive hemorrhage. A policy approach that neglects obstetricians, nurses and hospitals, in ongoing quality improvement efforts to reduce non-medically indicated cesareans, and instead focuses on the underpaid, least valued member of the team, the doula, may be less likely to succeed in its goals to improve maternity outcomes. We agree that “broadening the payer base” beyond the traditional fee-for-service private doula model is an important component of increasing access to doula care, and we support the policy advocacy efforts that are needed to secure more diverse sources of funding for doula services. At the same time, we caution against relying too heavily on arguments that position the doula as primarily a money saver and a cesarean reducer. Doulas need to be recognized and compensated fairly for the valuable, multifaceted, and often, unquantifiable, contributions they make to building healthy families and communities. At the same time, doulas cannot be held entirely responsible for reforming maternity care as we know it. Policy discussions of doula care must acknowledge this, and must carefully consider the sustainability of the reimbursement and overall structure of the programs they propose. The fact that doulas and policy advocates are turning their attention to ways in which doulas can help reduce racial disparities in birth outcomes is heartening, and much more effort is needed toward this goal. We encourage the development of a research and advocacy agenda that prioritizes work equity and social justice equally to cost savings, and we look forward to continued conversations about how to bring this into fruition. The authors thank Elliott K. Main, MD for his assistance in assessing the methodology of this study; Sheila Capestany, MPH, MSW for her perspectives on doula models of care and several anonymous reviewers for their critical comments. Hodnett ED, Gates S, Hofmeyr GJ, Sakala C. Continuous support for women during childbirth. Cochrane Database of Systematic Reviews, 2012, Issue 10. Art. No. : CD003766. DOI: 10.1002/14651858.CD003766.pub4. Pilliod, Rachel; Leslie, Jennie; Tilden, Ellen; et al. 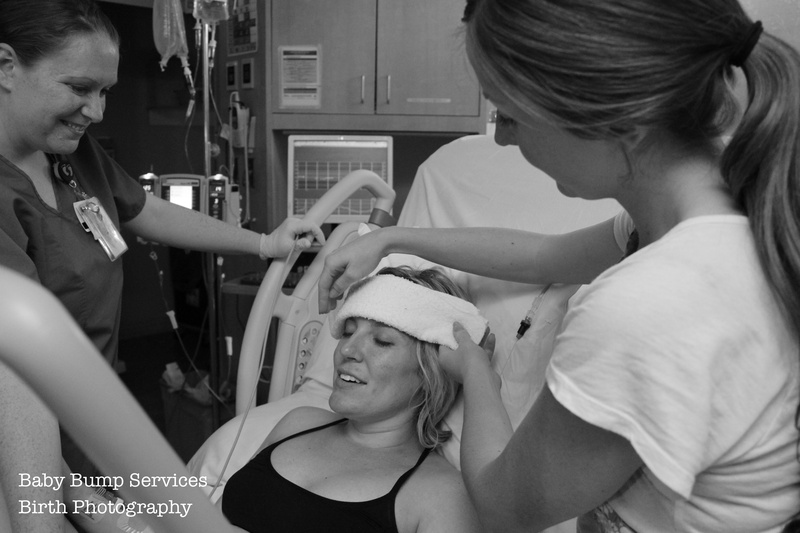 Doula care in active labor: a cost benefit analysis. Abstract presented at 33rd Annual Meeting/Pregnancy Meeting of the Society-for-Maternal-Fetal-Medicine (SMFM), San Francisco, CA, February 11-16, 2013, American Journal of Obstetrics and Gynecology, Volume: 208 (1); S348-S349. Monica Basile has been an active birth doula, childbirth educator, and midwifery advocate for 17 years, and holds a PhD in Gender, Women’s and Sexuality Studies. Her 2012 doctoral dissertation, Reproductive Justice and Childbirth Reform: Doulas as Agents of Social Change, is an examination of emerging trends in doula care through the lens of intersectional feminist theory and the reproductive justice movement. 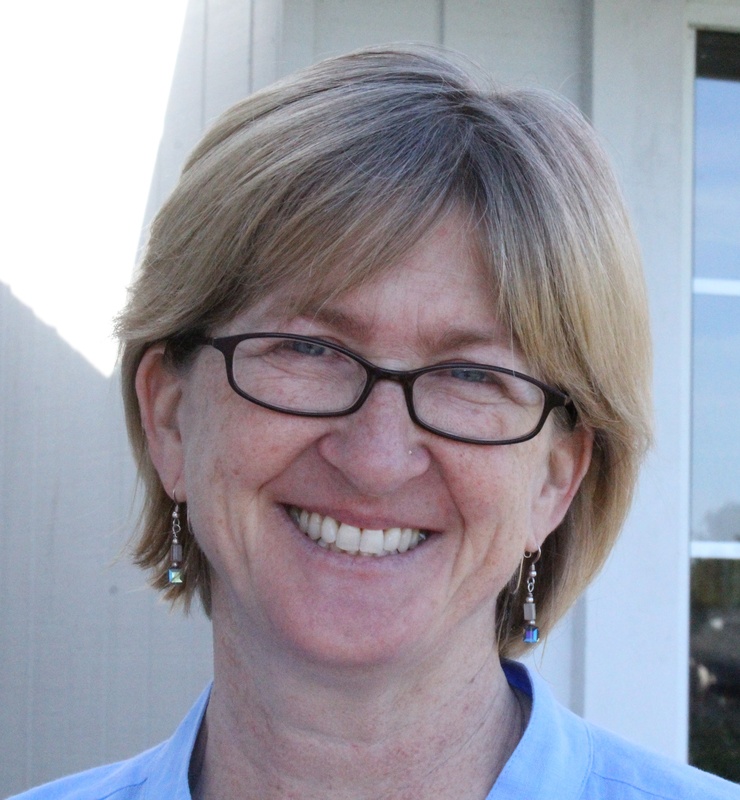 Christine H. Morton, PhD, is a sociologist whose research on doulas is the topic of her forthcoming book, with Elayne Clift, Birth Ambassadors: Doulas and the Re-emergence of Woman-Supported Birth in America, which will be published by Praeclarus Press in early 2014. The following is an excerpt of Chapter One: The Birth of Doulas: A Social History from the forthcoming book, Birth Ambassadors: Doulas and the Re-Emergence of Woman-Supported Birth in America, by Christine H Morton & Elayne G Clift, from Praeclarus Press. Doula care – encompassing the use of medical, herbal, and technological interventions, the social provision of physical assistance, and the culturally shared meanings attached to childbirth and mothering – has emerged as a unique response to the changing social and medical contexts of childbirth support in the United States. While throughout history and across cultures, human societies have had childbirth support systems that addressed the issues inherent in facing the unknown, encountering fear, pain and possibly death as they awaited a birth, the nature and manner of childbirth support has gradually been altered in the U.S. As last as the 1930s, childbirth support was concentrated within women’s social networks. Since the 1960s, however, it has become distributed among a variety of social actors, technologies and locations. In particular, labor support—the provision of emotional, physical and information support—became a specific role in the form of the doula. As social childbirth practices changed from 1930 to 1960, the fragmentation of childbirth support began, with medical experts claiming authority over pregnant women’s health and childbirth outcomes, and moving birth to the hospital. Subsequent decades saw the emergence of various political, professional and consumer negotiations around childbirth practices, which called for women to be ‘awake and aware,’ and take an active role in their birth experiences. In the past forty years there has been increasing accommodation to medicalized childbirth support, as well as renewed interest in merging holistic and medical approaches. It is in this period we see the emergence of the doula as a particular, specialized role in providing non-medical (emotional, physical and informational) support to birthing women. As the shift to hospital births became more widespread across the country, the traditional form of childbirth support radically changed. Now the technologies, physical support and meanings given to birth were incorporated into increasingly medicalized and professionalized arrangements. Physicians, holding out the promise of safety and sterility, moved to adopt practices and technologies that quickly became rigid and lacking in compassion for women’s subjective experience of birth. Obstetric nurses emerged as a distinctly American version of their European counterpart—trained midwives—without the title and without challenging physician’s leadership. The nurse’s role was to support and augment but not replace the physician, in responsibility or authority. Physicians depended on nurses to attend to patients, but were afraid of their potential for dislodging them from their preeminent place in maternity care both by virtue of their experiential authority but also by their emotional connection to women. Nurses then, as today, supported and cared for laboring women both emotionally and medically, managing the administration of medications, monitoring the health of the woman and her baby, and knowing when to call the physician. By the late 1940s, however, as nursing historian Margarete Sandelowski described, “nurses began to appear less like sisterly companions in labor and more like unfeeling robots.” Birthing women were now surrounded by and subject to the authority of professional medical and nursing staff in hospitals with new, ‘scientific’ ideas about birth and child care rather than among a community of like-minded women. Nursing care gradually shifted from a model of one-on-one to one-on-many over this period. Hospitals largely replaced home as the site of most births and kept women hospitalized for two weeks after birth, distancing them from their social support networks, and establishing institutional authority over proper infant care. Into this milieu came the first rumblings of discontent, with natural childbirth philosophies and methods imported from England and France. The modern period of social childbirth practices changed how various components of childbirth support had been structured, leaving patients dissatisfied with high tech incursions into the social provision of physical support. Although women eagerly sought some intervention to address their fears and compensate for the loss of social support networks, there were real costs. The dehumanizing practices embedded in the application of technologies (being strapped down, routine enemas and pubic shaves), and long periods of separation from their newborns had physically and emotionally traumatic affects on women, and their families. In the midst of increasing debate, childbirth reform activists began to organize and teach natural childbirth methods. Reform efforts, none of which challenged the authority of the physician, focused on educating women about the process of childbirth, granting fathers permission to be present at births, and helping women through childbirth. Various political, professional and consumer advocacy groups emerged to contest the medicalized aspects of childbirth support. Their critiques focused on women’s experience of being restrained and rendered unconscious. The alternative was for women to be ‘awake and aware,’ and to take an active role in the birth. Concerns were raised about the physical and psychological impacts of medicalized childbirth on infants, as well. Research on mother-infant bonding provided scientific legitimacy to some consumer demands. This period also saw a resurgence of licensed and nurse midwifery while childbirth education, begun with the goals to educate and empower women, became quickly incorporated into hospital practice, thus losing its independence. Gradually, it became clear to childbirth reformers that hospitals and doctors were not going to alter their practices around the assumption of ‘normal’ birth. Enter Ferdinand Lamaze, a French physician who had been influenced by the idea of conditioning the mind to influence the bodily experience of pain while observing Russian obstetric wards using this method. Lamaze developed the technique further, publishing his results in Painless Childbirth in 1956. Marjorie Karmel introduced this method in 1959 to the United States, in her book, Thank you Dr. Lamaze: a Mother’s Experience with Painless Childbirth, which detailed her experiences in Paris. Lamaze helped give credence to the view that women’s emotional needs in labor were related to childbirth outcomes and childbirth educators made it the cornerstone of their curriculum. Childbirth educators and midwifery advocates increasingly emphasized that how women feel during childbirth is critical to their experience of that birth, and to their subsequent transition to motherhood. Labor support as a stand-alone service developed when childbirth educators began attending births of their students, who were committed to natural childbirth, but who had no other support person available. Those women who wanted to try ‘natural childbirth’ brought a support person with them, usually the father of the baby. Writings from this time indicate that many women were successful in achieving natural childbirth, but were still considered to be on the ‘fringe’ of normal. Another birth story of the doula comes from the ongoing practice of women attending births during the 1970s, when the childbirth movement gained momentum from similar sorts of advocacy also underway in women’s health, patient rights and alternative medicine. During this time, many birth activists, childbirth educators, and partners, friends and family members accompanied women during birth. Many women claim they had been doulas before it was called that, ‘before it had a name.’ These were women who said they were always the one in their social network to attend the births of family members or friends, who had no special interest in midwifery or nursing, but ‘found themselves’ going to births frequently. The articulation of the ‘doula as professional labor support’ encompassed years of work as several women, together and individually, developed, elaborated and communicated the particular way ‘traditions’ would or could be adapted to ‘modern’ childbirth support. The idea of turning labor support into a specialized service niche that would complement but not overtly threaten or question ongoing medical management of childbirth support proved to be successful in attracting women who wished to provide this type of support, as well as women who wished to receive it. Changes in pain management, obstetric technology and professional roles in maternity care over the past 100 years have created a unique space for the role of the doula. She (doulas are usually female) provides a personal guide through advice and information surrounding pregnancy and childbirth and support during the birth experience itself. Today, doulas portray their role in maternity care within a historical framework that highlights the universality and particularity of woman-to-woman support during childbirth. Through this framework, they collectively construct an ideology that revalues care, as well as an innovative model for accomplishing that care in the current context of childbearing in the U.S. This model articulates an important social aspect of birth: Caring for and about women’s emotional experience of childbirth results in greater benefits to that woman, her relationship to that child and her partner, and by extension, to society as a whole. Birth Ambassadors co-author explains why she is a volunteer doula. Posted: Friday, May 31, 2013 1:09 pm | Updated: 1:17 pm, Fri May 31, 2013. With the second annual World Doula Week having just ended, I’ve been reflecting once more on why I became a volunteer doula and what the work means to me. I’m a baby freak, plain and simple. As a young candy-striper I routinely snuck into the pediatrics ward so I could rock sick kids. While my high school friends dated, I babysat. If I hadn’t been a product of the fifties, I might have considered becoming an obstetrician or a midwife. Instead I followed the path that most girls my age did: I went to college for a liberal arts degree and then became a secretary – a medical secretary. My real career began when I became program director in 1979 for the National Women’s Health Network, a Washington, D.C.-based education and advocacy organization dedicated to humane, holistic, evidence-based, feminist approaches to women’s health care. In 1985 I went to Nairobi for the final international conference of the United Nations Decade for Women. Inspired by that amazing event and armed with a master’s degree in health communication, I began working internationally on behalf of women and children, always trying to bring a gender lens to the table. In the midst of all this, I gave birth twice. My children were born in the 1970s as the women’s health movement, and individual women, were beginning to advocate for natural childbirth and to resist the traumas of overly-medicalized birth experiences. We took Lamaze classes, learned about nursing, expected dads to be active in our deliveries. I was lucky – not only were my labors quick and unremarkable, but the small community hospital where I delivered was sympathetic to the changes taking place in birthing. There were no monitors, no drugs “to take the edge off” if you didn’t want them, no enemas, no shaving and no macho-docs (although I couldn’t talk my doctor out of the episiotomy). I labored with my nurse and my husband and when the time came to push, I watched my babies come into this world in total awe of what had just happened and what I had done. One of the early births I attended stands out in my mind. It was a first pregnancy and the mom labored stoically for 36 hours, pushing for five, before her son was born. As the hours passed, I held her hand, wet her lips, wiped strands of matted hair from her eyes, rubbed her back. “You can do this,” I whispered in her ear when she grew doubtful. “You’re doing a magnificent job! Soon your baby will be born.” As the baby finally crowned, wet, dark hair pressing urgently against her, I held the mother’s leg in my arm, her hand clenching my free wrist as she cried out with that guttural groan of a woman pushing her child to life outside the womb. “Yes,” I said, my own eyes filling, “Miraculous.” Always miraculous, no matter how many times you give witness, or weep yourself to see a woman giving birth. Doula supported childbirth has been proven to reduce the incidence of c-sections, shorten the length of labor, reduce the number of medicated births, increase breastfeeding and provide higher satisfaction for mothers regarding their birth experience. That is why I feel privileged to do this voluntary work. It is simply an honor to give witness to birth, and to offer as many women as possible the opportunity to have a birth that is supported, memorable, and full of joy. Elayne Clift, of Saxtons River, Vt., is co-author with Christine Morton, of “Birth Ambassadors: Doulas and the Re-emergence of Woman-supported Childbirth in America,” forthcoming from Praeclarus Press. This essay is adapted from her preface to the book. Women who give birth the U.S. often find that it is very difficult, so many are hiring doulas to provide continuous labor support. A new book from Praeclarus Press, Birth Ambassadors: Doulas and the Re-Emergence of Woman-Supported Birth in America, describes the work of doulas, the dilemmas they face, and why they have become the ambassadors for the midwifery model of care in the U.S.
An increasing number of American women are hiring doulas to attend them during labor and provide continuous labor support. For many women, this a way to counter the highly interventionist births they are likely to encounter in American hospitals. Rates of cesarean sections are at an all-time high. Almost half of American women described their recent childbirth experiences as “traumatic,” with 9% meeting full criteria for posttraumatic stress disorder. Doulas provide individual attention, information, and support to their clients. But this role does not come without dilemmas, as Christine Morton and Elayne Clift describe in their forthcoming book, Birth Ambassadors: Doulas and the Re-Emergence of Woman-Supported Birth in America, new from Praeclarus Press. One dilemma doulas face is how to advocate for the woman in hospitals, where they may not be welcome. Another dilemma is what doulas should do when hospital policies or clinical practices violate their core beliefs that women have the right to plan for their birth, to be active participants in their care, and to be treated with dignity and respect. This core belief can be at odds with the structural care models currently in place at most U.S. hospitals. Thus, doulas sometimes find themselves in awkward and emotionally charged interactions with health care providers. While egregious cases of obstetric maltreatment do occur, more common are cases in which a woman’s desire for an unmedicated birth is not respected, or when interventions are proposed without allowing for a full discussion of risks and benefits. Women may feel coerced into intervention because clinicians implicitly–or explicitly– convey the idea that if a woman does not comply, she will harm her baby. Knowing how to handle situations like these is often difficult for women working in hospitals as doulas. Women often become doulas because they want to support women in childbirth. But to continue, they need to find ways to navigate the challenges inherent in their role. 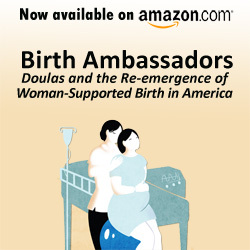 Birth Ambassadors summarizes results of the first scholarly study of the role of doulas and the dilemmas they face. It is a fascinating and readable volume destined to become a classic in women’s health. Christine H. Morton, PhD is a research sociologist whose research has focused on women’s reproductive experiences and maternity care roles. Since 2008, she has been at Stanford University’s California Maternal Quality Care Collaborative, where she conducts research on maternal mortality and morbidity. Elayne G. Clift, MA is a writer, journalist, and Humanities adjunct professor. She has worked internationally as a health communications and gender specialist, and is an educator/advocate on maternal and child health issues. A volunteer doula and Vermont Humanities Council Scholar, she has edited anthologies and published fiction and poetry collections, a novel, and a memoir. Praeclarus Press is a small press founded by Dr. Kathleen Kendall-Tackett and specializing in women’s health. It features books, webinars, and products that support women’s health throughout the lifespan. Praeclarus Press is based in Amarillo, Texas, USA.